GenCon is coming up next month and it’s a big one: the 50th anniversary! We will, of course, have a booth (#1321) and we’ll be debuting the Critical Role: Tal’Dorei Campaign Setting there (pre-orders for which started today). GenCon is doing a lot of cool stuff to celebrate the anniversary, including a recreation of Lake Geneva’s Horticultural Hall, site of the very first GenCon. There will also be a museum with all sorts of artifacts from the history of the hobby, including a couple of Green Ronin books. I already wish I was going to have more time to check all that stuff out! The anniversary has, of course, made me think about my own history with the show. 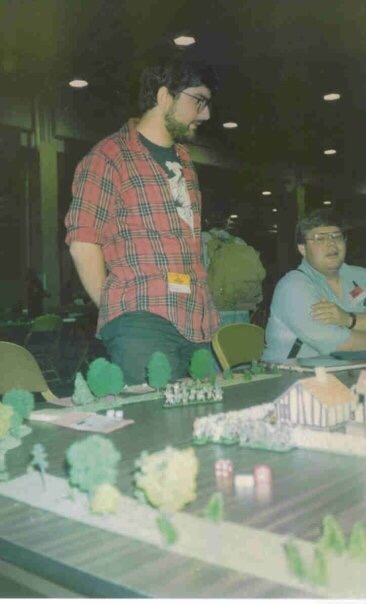 I first went to GenCon in 1989, when I was in college. I didn’t know anyone there. I went out by myself, had an amazing time, and convinced some friends to come back with me the following year. I’ve never missed a GenCon since. In 1993 it started to turn into work, as I began to pursue a career as a freelance game designer that eventually lead to me becoming a publisher. For a long time now the focus of the con has been work and I wouldn’t give up that up, but I do look back on those first five GenCons with much fondness. In those days I came to play and I did not mess around. I would usually play in three 4-hour events per day. I would try to have one block free so I could get food and hit the dealers hall, but sometimes the events would line up so that I’d play for 12 hours straight. Some of the bigger miniatures game I played would be 8 hours by themselves! I didn’t mind. Quite the opposite! I was hungry for it, and I developed strategies to maximize my fun. At the time, I worked at an old school Italian coffee store in New York City. To save money and also time, I began bringing ground coffee, filters, and an electric kettle with me from home. I’d make a big thermos of coffee in the morning and drink it all day. One year, when I could barely afford a plane ticket, I brought a loaf of bread and a jar of peanut butter and that was most of my meals that week. I hear folks complain about the various online registration systems in use at conventions today and all I can think about is fax machines. Back then you’d get a program book in the mail ahead of time and a sheet where you’d fill in your requested games and some alternates. On a specified day, you would fax it to TSR’s headquarters. Or try to anyway because thousands of other people were jamming up the fax lines at the same time. I was working a different job one year and one my regular duties was faxing various documents. Come registration day, I took my sign-up sheet, told my boss I had to make a fax for our department, and then spent an hour and a half in the basement trying to get it to go through! I pity the poor TSR staffers who had to hand collate all those sheets and fill the games. Closer to the con you’d get an envelope with printed tickets for your events. You often didn’t get all the games you wanted, so they’d fill out your order with generic tickets. On site, they had a giant board where the tickets would hang from rows and rows of hooks. You could wait in line and try to get into more events there. As you got the front, you could actually figure out which events still had tickets left by looking at the code numbers under the hooks that weren’t empty. In this era GenCon was in Milwaukee. I don’t know if this is still the case but the downtown often smelled like chocolate because there was a factory there. Fun fact, it’s where noted cannibal Jeffrey Dahmer used to work! Every year there was a rush on the Hotel Wisconsin because it was cheap (like $64 a night) and close to the convention center. There was a diner on the ground floor where we’d get breakfast some mornings. I remember tying to order a bagel there and the staff had no idea what I was talking about. This was a confusing experience for a New Yorker. It did not help that was a vegetarian at the time. Let’s just say the options for non-meat eaters in Milwaukee in the early 90s were not plentiful. There was a terrible sports bar called Major Goolsby’s across from the convention center and I once ordered what they called a Wisconsin cheese sandwich there. Seemed safe enough. Wisconsin! Cheese! Why, there’s even a cheese museum on the highway between Chicago and Milwaukee. I get my food and it is a hamburger bun with one slice of American cheese, one piece of lettuce, and one slice of tomato. Sad vegetarian was sad. But hey, no one goes to GenCon for the cuisine. I was playing tons of games and meeting new people every year. I loved the dealers hall then because the internet was barely a thing and there was so much gaming stuff I’d never see anywhere else but there. Finding that game I’d only heard about or scoring something long out of print felt like victories. The auction was great for that and I spent a lot of time between games there. After my first GenCon experiences, I decided I wanted to start running games myself. Ars Magica was my favorite RPG then, so I began to run a two round ArM tournament. The characters and their covenant persisted year to year and I built on stories that played out in the finals. I did that for four years and it was a useful bridge between just being a fan and starting a career as a game designer. The things I learned playing and running games, and the people I met and the contacts I made, all played a role in me taking that leap. For these reasons and so many more, GenCon will always be special to me. So thanks, GenCon! Happy 50th and here’s to 50 more!